It’s the most romantic season—but it’s also go-for-broke tax time, and your well-worn DVDs of The Princess Bride and Shaun of the Dead could use a rest. Fear not, nerds! We’ve scoured the three big streaming services to find sweet (and not-so-sweet) genre picks perfect for Valentine’s Day viewing. Wrapped deep within Buckaroo Banzai’s nutty plot—about a genius scientist-slash-rock star and his equally eccentric pals working to prevent a long-brewing interstellar and inter-dimensional war—is a love story. Jamming onstage with his Hong Kong Cavaliers, Buckaroo (Peter Weller) notices Penny (Ellen Barkin) sobbing in the audience and stops the show to talk to her. After she’s arrested for—oops!—firing a gun in the club, he goes the jail and realizes his déjà vu was onto something, because she’s the long-lost identical twin sister of his late wife. Hey, stranger things have happened! This is seriously the saddest moment in the whole movie. Clem (Kate Winslet) and Joel (Jim Carrey) in one of Joel’s memories. Boy meets girl, boy loses girl, boy realizes girl has had him erased from her memories, boy decides to undergo the same procedure but regrets it midway through. Then, after all that, boy and girl meet for a second time, and decide to try again despite everything, because love is irresistible like that. Teenage suicide, don’t do it. We recently learned that Riverdale is doing a Heathers musical episode—so there’s no better time to revisit the 1988 cult classic that satirizes how hellish high-school cliques can really be. All the Westerburg High School queen bees are named Heather, except for the one named Veronica (Winona Ryder), who’s already grown weary of popularity politics by the time she meets bad boy J.D. (Christian Slater). Theodore and Samantha (not pictured...because she’s an OS) at the beach. It’s no secret that we’ve become big fans of Hulu and Blumhouse’s Into the Dark holiday-themed horror series (standouts so far include New Year, New You and Pooka! )—and if you haven’t gotten around to this month’s installment, Valentine’s Day is the perfect excuse. Why? Well, because that’s the holiday that Down is tied to, though if you’ve seen the other episodes you know Into the Dark is very much focused on horror above everything else. Daniel Stamm (The Last Exorcism) directs this one, about corporate co-workers (Natalie Martinez and Matt Lauria) who get stuck on an elevator together after working late on you-know-which red-letter day. Annoyance turns to panic turns to...well, other stuff, which we won’t spoil here, other than to say Down is a cautionary, timely tale that gets very dark indeed. Xoxo! 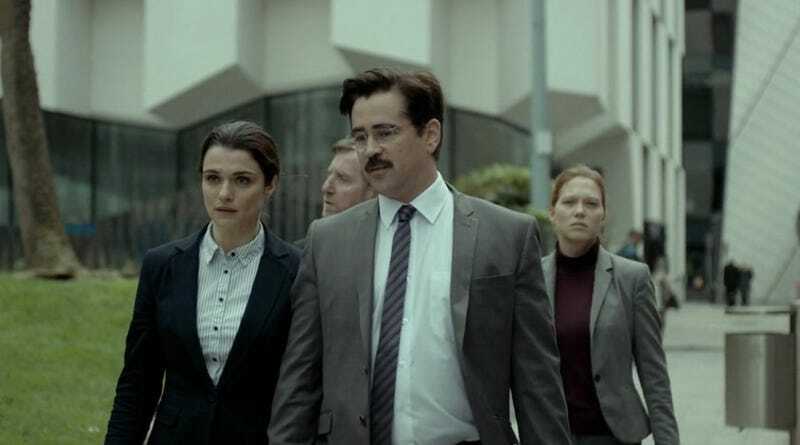 Yorgos Lanthimos has achieved his greatest critical success and mainstream reach to date with The Favourite, but many people first heard of him thanks to black comedy The Lobster, the Greek filmmaker’s 2015 English-language debut. The Oscar-nominated screenplay offers one of the bleakest and yet weirdly hilarious takes on relationships ever, imagining a world that forces all people to couple up, though there’s also an outsider community of “loners” who aren’t nearly as free as you’d think. Scott (Michael Cera) drools over Ramona (Mary Elizabeth Winstead). Even if you think the title character (played by Michael Cera) is an irritating little turd, there’s still plenty to love (and plenty of other very cool characters, some of whom also think he’s a turd) in Edgar Wright’s 2010 adaptation of Bryan Lee O’Malley’s comic. Slacker wannabe rock star Scott already has an adoring girlfriend, but he goes utterly ga-ga for new girl in town Ramona Flowers (Mary Elizabeth Winstead). Ok, we had to include one movie that’s isn’t afraid to be extremely schmoopy and corny...though the very complicated relationship at its center is about as sci-fi as can be. Rachel McAdams plays the title character; Eric Bana plays the guy who zips through time, a genetic ability made way less awesome by the fact that he can’t actually control it whatsoever. He appears as randomly as he disappears, a rough life no matter how you look at it, but made even worse by his growing desire to just be able to, like, hang out with his beloved, a woman he’s been “visiting” since she was a little kid (though their romance doesn’t spark until it’s totally age-appropriate, of course).